Irish astronomers say we might be able to see light display in night sky as a result of ‘X-flare’. AN ERUPTION FROM the face of the sun has sent particles of matter flying towards the Earth. 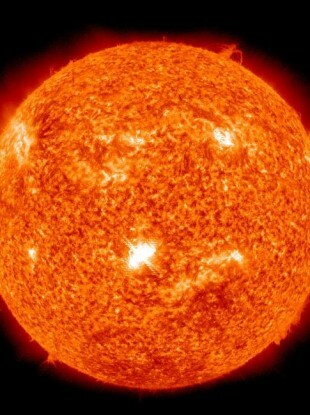 NASA has reported that a solar flash was emitted from a large sun spot early on Sunday morning. The Solar Dynamics Observatory spacecraft recorded the image depicted here. The sun spot, clearly visible in the centre of the sun, sent out the strongest flare in four years. There is a chance that we will see aurorae tonight or tomorrow night. What will happen is if people look to the north in the night sky, they might be able to see greenish clouds. It depends on how strong the aurorae are – they may not be visible at all or we might see them overhead as you normally might in more northern countries like Norway or Canada. It can happen, although it probably won’t affect Ireland. In the 1980s, a solar flash knocked out the power supply to a big chunk of Canada. This sun spot was pointing directly towards Earth yesterday when it threw out those charged particles. Email “Massive solar flare sends particles towards Earth”. Feedback on “Massive solar flare sends particles towards Earth”.